Today we finally got to our remote field camp. It is called WAIS Divide Camp. WAIS stands for West Antarctic Ice Sheet. 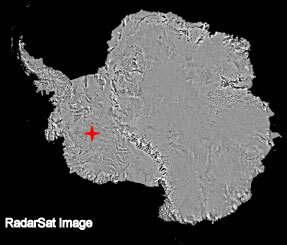 So I guess you can figure out that this camp is in West Antarctica. 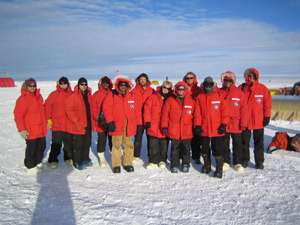 This is the whole PRISM team and Julie Palais, who is a Polar Program manager at the National Science Foundation. Julie is a glaciologist who actually had an automatic weather station in Greenland named after her. The weather station is now gone, but the weather data are still there if you want to look at them. She was going back to Washington, DC on the plane that we took to WAIS. One of the first things we did was go set up our beds in the residential building. We can sleep on the floor inside this large building or we can sleep on a cot. We decided to sleep on a cot. We think that will be more comfortable. 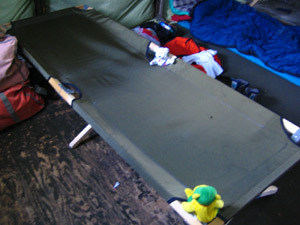 We added an air mattress to the cot so it would be more comfortable. You just unroll the mattress and let it fill with air. Then you close the valve. 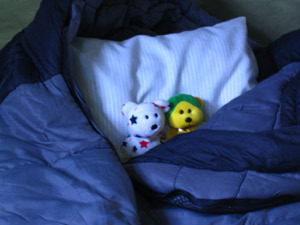 Then we unrolled the sleeping bag on top of it. 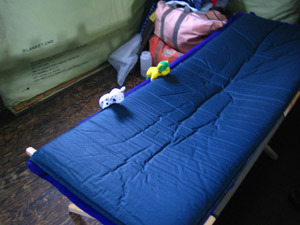 Then you add a pillow and zip up the sleeping bag and you are comfy- cozy. The residential building has a heater too, so we won't be cold, even though it is colder here at WAIS than it was in McMurdo.